When one thinks of a surf camp, what comes to mind, besides perfect waves every day? Great accommodation and effective surf lessons, that's what it is! Since exactly this is Peniche, the waves part is more than covered, which leaves you with the accommodation part in which you excel. The surf lesson involves everything which is related to the surfing experience and this means not only learning how to ride waves with a surfboard but also learning everything that is involved before and after those magical moments in the ocean, thus improving your chances for better rides in the future. Relax and have a safe fun because by choosing Alex Surf School, you're in good hands! When it comes to the accommodation, as with all Alex Surf Hostel services, it's all about a personalized approach. In other words, there is something for everyone. Alex Surf Hostel has a solution for each and every need. Several types of accommodations / apartments are available, with different prices, according to the number of rooms, house guests and / or in the proximity of the Peniche and Baleal beaches. You can choose between self-catering houses and apartments in Baleal, Peniche and Silver Coast or you can stay in our hostel located in Baleal. While staying in Baleal, you are closer to the best surf spots, beaches and bars, having the best parties as well. The advantages are many staying at Alex Surf Hostel, starting with the fact that you will find fellow travelers with the same interests, surfers for surfers. Located in the fantastic Baleal, Peniche, the hostel is the ideal accommodation for a surfer of any level, be it beginner, intermediate or advanced. The staff is the cherry on this cake, ready to take care of all your needs and make your time in the beautiful Baleal, Peniche a memorable time. Sun, surf and fun, it's all here. Regarding the specifics of the accommodation, Alex Surf Hostel can arrange and adjust according to your needs, be it a single traveler, with friends or a bigger group. All is possible. You can rent the whole hostel or individual private rooms. Alex Surf Hostel has rooms for four people (for instance two kids and parents), or for a big group of 10 to 11 people. If you want, Alex Surf Hostel provides. Plus, you get the personalized attention of true local surfers to ensure you have the best time, enjoying all that the Baleal, Peniche area has to offer, in and out of the water. Welcome to Alex Surf School, the ultimately personalized surf camp of Peniche, the renowned surf city worldwide. It is never too early or too late to learn how to surf. Being either a small kid or a senior citizen, you should always deserve to have fun. Surfing secret spots are part of the surf experience and probably one of the best. Alex Surf School guiding service will take you there, at the right spot, on the right time, for each combination of swell, tide and wind. Between quality surf classes and accommodation / apartments of according level close to the beach, this is the surf academy of choice. Guided visit through the Peniche coastal area and to several spots around is included in the price, also tour of surfboard factories. Peniche was once an island, nowadays, the stretch of land (mostly sand) that connects it to the mainland is the only place where you won't find waves. In 20 minutes, you can check several surf spots of opposite wind directions and different swell exposure. It is perfect and extraordinarily special, that's for sure, thus making it the local surfers and visitors alike to feel spoiled. A surf resort like this doesn't come by easy, nor do surf holidays, get so productive as here. And how can one not mention the famous World Tour event or the prestigious Rip Curl? Peniche is a peninsula surrounded by waves, which always has a surf spot with the offshore wind, with beautiful and organized waves, ready to be enjoyed by the surfers who know where to find them. Besides being the most consistent place to surf in Portugal and Europe, Peniche and especially Baleal, have the laid back style which is so characteristic to Portugal and to the Portuguese people. Also, due to all the international visitors and residents, Baleal is like the surf city within the surf capital, which Peniche has become nowadays. But don't worry, it's still a lovely village where life goes as slow or as fast as you wish. The surf possibilities are immense, almost endless, so don't stress about the crowd at the more obvious surf spots. There are always several alternatives which Alex will show you. In addition to all of its natural beauty, Peniche has the great advantage of concentrating so many good surf spots in such a short distance, making your daily search for the best surf spot much easier than anywhere else in Portugal or Europe. Less energy and time (and money of course) spent looking for waves, more time surfing them. You will find waves of all degrees of difficulty, which translates into a flavor for everyone. It's a definitely year-round surfing destination, be it challenging Supertubos, Lagide, Cantinho da Baa, Almagreira, etc, you name it. It's a given that you'll find a suitable wave for your surfing to progress. Besides the surfing, there is much more to enjoy in the Peniche area, starting with the amazing food, recognized worldwide, especially the fish, so fresh and tasty. If the daily catch doesn't faze you in a good manner, sure the great nightlife will. The diversity of the origin of the international partygoers makes for a very interesting mix, to say the least. But don't be scared if this sounds like too intense. You can get as relaxed and undisturbed as possible if that is your wish, be it hitting the golf course, spear fishing, pole fishing, or going for a stroll around a close by the lagoon, the possibilities are endless. The growing local surfing community is mostly made of visiting surfers that just can't find the strength to leave. You too will quickly find out why Peniche is quite the opposite of a one-day stopover, a must for any traveling surfer in the know. Of course, if you want to sample a different culture and food offer, besides the ones in the regional area, you are still close to Lisbon, the capital city of Portugal, rightfully named the most interesting city in Europe. In a nutshell, Peniche is the Portuguese (and European for that matter) surf capital. A peninsula (more like an island) where you can surf pretty much every single day of the year due to the privileged geography of the region, with consistent conditions to learn or improve your surfing. So, great food, great nightlife, history, scuba diving, people, golf courses, take your pick. All of it at reasonable prices for a developed country, known for its great weather, fish and relaxed people. So unless you're against having a good time, this is a place you should seriously consider. Alex Surf Hostel has a great barbecue area at the back of the hostel and a normal kitchen inside so you'll have plenty of cooking options. The necessary ingredients for cooking your meals and drinks are not included. Supertubos is the Portuguese Pipeline. This event is quite a show and gives you the opportunity to see the world best elite surfers battling it off in heavy tubes just a few meters from the spectators. 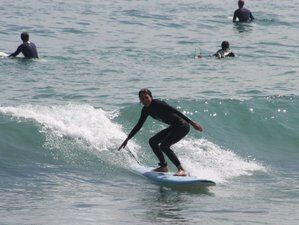 This surf camp is available from March to December.